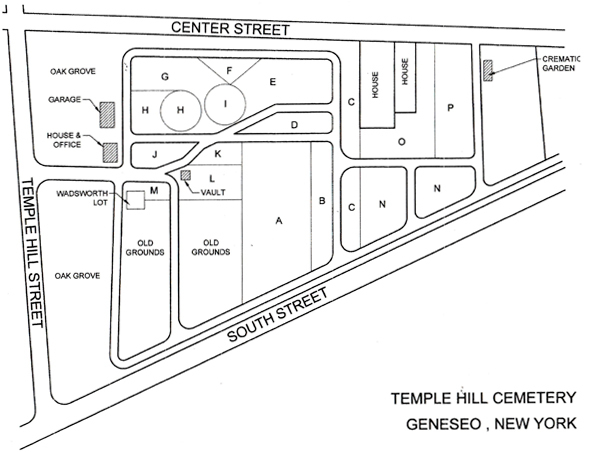 The Temple Hill Cemetery is located at 111 Temple Hill Street in Geneseo, NY. The cemetery is open daily from 6:00am till 9:00pm, year-round. If you visit by vehicle, please park anywhere along Temple Hill Street during your visit. You may wander freely on the property, but please take advantage of our paths when possible. This 1874 map below shows the Cemetery Grounds. At present there is no modern day map available. Please contact the Superintendent to find a specific grave site or to review this 1874 map in person. A simpler map is also available. Click HERE for a printer friendly version of these maps. NOTE: A new page will open.